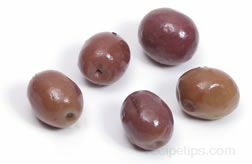 A medium sized purple or purplish-black olive grown in southern France that contains firm textured meat. It is available fresh or dry-cured, soaked in a black pepper marinade to give it a richly seasoned flavor. It is most often used as an hors d'oeuvre or as a complement to salads. It may also be referred to as a grosane olive.